Work will continue to November 2019. T. Howard Duckett Reservoir and then to the Water Filtration Plant for treatment. The Patuxent Plant produces approximately 30 percent of the drinking water for WSSC customers. The dam is structurally sound, the Federal Energy Regulatory Commission and MDE inspect the dam regularly and has found that the dam is well maintained and structurally sound. The work is needed to make repairs to the 70-year-old structure to prolong the Dam’s life into the future. This project will replace the Intake Tower bar screens and sluice gates, replace the side plates and heaters for the tainter gates, strengthen the gates, replace the coating on the gates, and replace the concrete spillway surface. It is estimated to take approximately two years to complete. 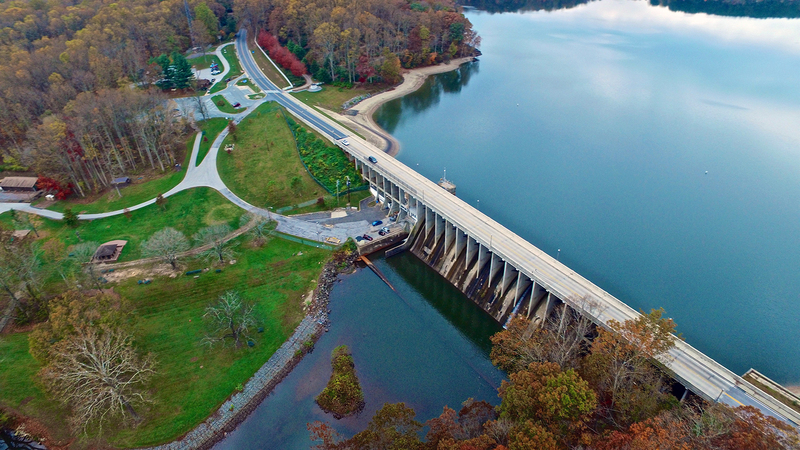 The community impact of the project is that the Triadelphia Reservoir may be lowered significantly so that most middle range rain events will not damage the work efforts. Once construction begins recreation areas located along the reservoir, including boat ramps will be closed to the public. There will be some truck traffic and Brighton Dam Road will be reduced to a one-lane bridge over Brighton Dam with the traffic flow being controlled by traffic lights.